To remove dog hair from a couch you need to use a brush, a rag, or a specialized cleaning solution. The choice depends on the upholstery material and your personal preferences. 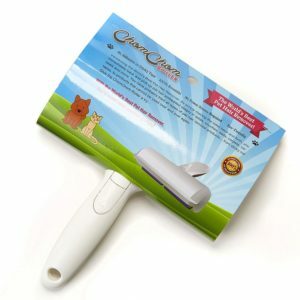 Today, there is a wide range of highly effective pet hair removal tools available. They are affordable and make cleaning your home very easy. Therefore, you shouldn’t let any fear for your furniture or carpets to interfere with your desire to get a dog. Pets are great for your health, it’s a fact supported by ample research and health organizations like CDC. From experience, I can also say that family visits to the dog park and everyday walks with your pet are great for bonding. They offer you all the benefits of family outings as well as the health boost of leading a more active lifestyle. Removing dog hair from a leather couch is very easy and you won’t even need any special tools for it. You can effectively clean this type of furniture by wiping it with a plain piece of soft cloth. For a more thorough cleaning, you can use a vacuum. However, only use the device with a soft brush to avoid scratching the leather with plastic parts. To complete the cleaning and not only remove pet hair but dander as well, you need to wash your couch. As it’s leather, you should use a specialized cleansing solution. If you don’t want to buy a specialized leather-friendly detergent, you can use any mild soap. It’s important to avoid alkaline solutions as they damage the material. A dollop of your pH neutral body wash will do. However, to minimize the risks, you should try out the cleaning solution on a tiny patch of leather somewhere out of sight. You should avoid soaking the couch. Leather doesn’t fare well when in prolonged contact with water, so dry it with a soft cloth right away. And remember, while it’s easy to remove dog hair from a couch upholstered in leather, it’s nearly impossible to remove scratches. Therefore, if you want your furniture to look good, you shouldn’t let the pet onto this kind of couch at all. Note that all these pet hair removal tips also apply to vinyl seating. You can use the same methods and tools to remove dog hair from a couch regardless of the exact type of the fabric. To make the removal easier, you should lightly spray the upholstery with a diluted mix of fabric softener and water. 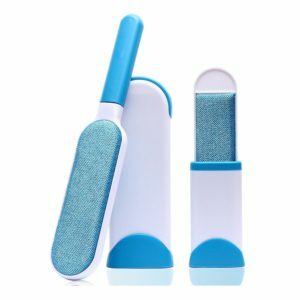 Let it sit for a couple of minutes before you start using any of the pet hair remover tools listed below. The softener will make it easier to get the pet hair ‘unstuck’ from the material. It will also freshen up the smell of the couch, thus helping you remove the ‘dog aroma’. Of course, you can use your regular vacuum cleaner to remove dog hair from a couch. However, specialized pet hair removal devices available today are much more efficient. The majority of them are cordless, handheld, and very powerful. Therefore, these vacuums can make your couch clean within a few minutes. They come equipped with multi-layered filtration systems and are easy to clean. 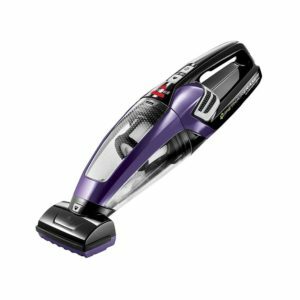 You should look for a pet hair vacuum with rubber nozzles. These models are more efficient in pulling out hair from the upholstery. Some of the more advanced devices available on the market today come with a variety of extra tools that make it easier to remove hair from every nook and cranny of the couch. If you can afford it, buy a model with a motorized brush as it’s most efficient. Brushes are one of the simplest yet effective tools that can help you remove dog hair from a couch. They come in a wide range of sizes and shapes to make the task easier. I advise buying a set of several brushes so you can better clean different parts of the couch. Some areas can only be reaches with smaller pieces. While I believe that a pet hair remover brush should be in every dog owner’s arsenal, I honestly admit that it’s not the best tool. Don’t get me wrong, it can get hair off the couch. However, brushing the thing by hand is exhausting. You also need to admit that no matter how good a brush is, a vacuum will always be more efficient. Overall, you should consider using a vacuum as your ‘primary’ dog hair removal tool, and a brush to pick any stray hairs that are left. You can also use a brush to quickly remove dog hair from clothes. But it won’t be much help when dealing with carpets. If you need to remove dog hair from a couch in a few quick sweeps, a pet hair glove or mitt will be a good choice. This tool is very simple and reminiscent of the brush. Due to the fact that it’s a glove, its size is rather limited. Therefore, it’s not a perfect option for a thorough cleaning. However, if you keep your couch generally dog-hair-free, it’s a good tool to clean up some minor ‘messes’ quickly. 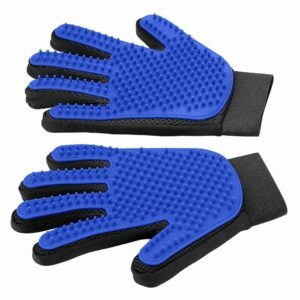 Note that you can also use a pet hair glove to ‘collect’ shedding fur from your dog. You simply need to pet the animal with it and the glove will reduce the amount of loose hair that can potentially make a mess of your couch. A roller is a very simple tool that allows you to remove dog hair from a couch with very little effort. There are several types of rollers available, so you can try different options to see what works best for you. The most popular kind of roller is the one covered with adhesive tape. You peel it off in layers and the ‘fresh’ adhesive will take care of the dog hair. There are also reusable rollers that are made from similar materials to pet hair brushes. All rollers can also be used to remove dog hair from clothes. However, like brushes and gloves, they aren’t very effective for a thorough couch cleaning. They say that prevention is the best defense. It’s definitely true when it comes to dog hair removal from furniture. However, if you have a furry pet in the house, it’s impossible to prevent its hair from getting onto your upholstery completely. But you can minimize the mess with a few simple tricks. In this case, it’ll be easy to remove any stray hairs using a brush/roller/glove to make your couch look pristine. The most effective way to protect your upholstery is to cover it. 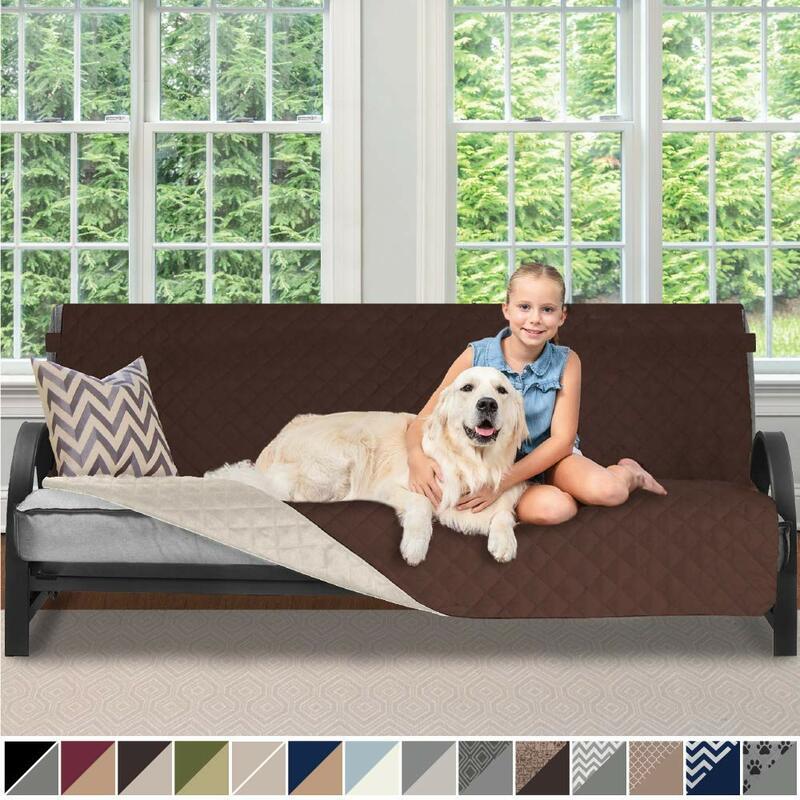 There is a great variety of specialized pet couch covers available today. You can find them in any size, so there is definitely a perfect fit for your couch. They also come in many designs, so you might actually use one to enhance the furniture’s look. The covers are made from materials that are easy to clean and that are generally resistant to dog hair. Speaking of dog-friendly upholstery materials. According to some dog owners, velvet is one of the best options. But bear in mind that while it’s easy to remove dog hair off a velvet couch, it’s very hard to remove stains from it. Did you know that having a humidifier that prevents your home from becoming too dry offers some major health benefits? Keeping the humidity level in your house ‘normal’ also makes it easier to remove dog hair from a couch. Dry air indoor allows for higher levels of static electricity. This doesn’t make your dog shed more, but it does make it much harder to remove dog hair from furniture, floors, carpets, clothes, and even your food. Note that keeping your home adequately humid also reduces the risk of allergies and respiratory diseases. As young children are very susceptible to those, this device is a must-have for every family with kids. You won’t have to worry about how to remove dog hair from a couch if your dog isn’t allowed onto it at all. Of course, a bit of fur will make it onto the upholstery, but this amount will be minimal. Start training your dog to stay off the couch from day one. Don’t falter in your commitment because letting the animal onto the furniture ‘on special occasions only’ will ruin the training in its entirety. Grooming your pooch is necessary not only to make it easier for you to remove dog hair from a couch. It’s also essential for maintaining your pet’s general wellbeing and health. Poorly groomed fur can get matted and form knots that will be dangerous for the animal’s circulation. Some breeds of dogs might even end up losing limbs if their fur is neglected badly. Brush your dog twice a week. Use a specialized brush suitable for the breed or a FURminator. If the breed requires it, give your pet hair trims once a month. You might need to increase the frequency over the summer and spring. Shedding is most active during these seasons. Give your pet a bath one or two times a month. Note that you should use only specialized pet shampoos. Otherwise, you will damage the animal’s skin and it might start losing its fur completely. Those are ‘universal’ rules, but some dogs require more specialized care. You should consult your vet or a professional pet groomer to develop the right routine for your pooch. If your dog continues to shed at alarming rates despite proper grooming, visit a vet. This might be a symptom of many health problems. You also shouldn’t forget that the animal’s diet greatly affects the health of its coat. Therefore, make sure your pooch gets to enjoy nutritious and well-balanced meals. It will need some doggie-vitamins as well, especially in early spring. And if you haven’t gotten a pet yet, check out dog breeds that shed less. All dogs shed to some extent, but these are the ones that should give you least trouble with cleaning. In theory, they should also be safe even if a person is allergic to pet dander. The best way to get dog hair off a couch is to use a combination of methods and tools. My personal couch cleaning plan goes like this. I use a pet hair vacuum once a week and a brush or a roller whenever I need to clean a particularly messy spot fast. I’d like to stress that it’s extremely important to keep your pet well-groomed and nourished to reduce shedding issues. A healthy and cared for dog won’t be shedding too much, regardless of the breed. Therefore, by caring for your precious friend, you reduce the amount of work you’ll need to invest in cleaning up after them. What methods and tools do you use to remove dog hair from a couch? Have you ever faced some unique challenges when doing this? I’ll be happy to hear about your dog-related experiences. Please, share them in the comments below!